Solely on the basis of the Bible, and a fairly conservative view of its inspiration, this book challenges the traditional church dogma that Jesus is God. Yet it also affirms all other major church teachings about Jesus. 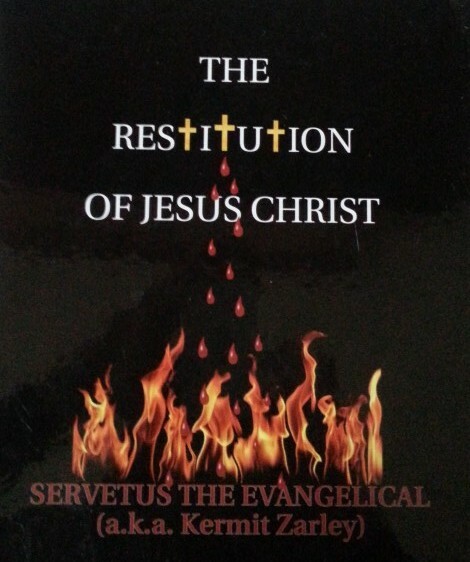 Over twenty-five years in the making, The Restitution of Jesus Christ is a sophisticated, theological tome of 600 pages in length. In it, Kermit seek to restore the true identity of Jesus of Nazareth. Solely on the basis of the Bible, and a fairly conservative view of its inspiration, this book challenges the traditional church dogma that Jesus is God. Yet it affirms all other major church teachings about Jesus, including his virgin birth, miracles, sinless life, atoning death for others, resurrection from the dead, ascension to heaven, exaltation there, and future return to earth to establish his glorious, worldwide kingdom of peace. The book treats in-depth all of the major, critical texts of the Bible that are generally believed to affirm that Jesus is God. It also examines a few biblical texts that many think identify God as three Persons. In doing so, the book cites the writings of over 400 scholars. This book was first published under Kermit’s pseudonym–Servetus the Evangelical–as a testament to the theologian and physician Michael Servetus. In 1553, he was tried by the state of Switzerland and burnt at the stake for denying infant baptism and the church doctrine of the Trinity in his books entitled On the Errors of the Trinity and The Restitution of Christianity. Kermit Zarley has been an Evangelical Christian all of his adult life and more. He believed in the doctrine of the Trinity for twenty-two years until reading himself out of it in the Bible.